The AdEx Benchmark H1 2018 Study reveals that mobile ad spend crossed the €10bn mark and is approaching a 50% share of digital ad spend. The latest European Programmatic Market Sizing Report published by IAB Europe and IHS Markit shows that more than half of programmatic display spend is in mobile formats. 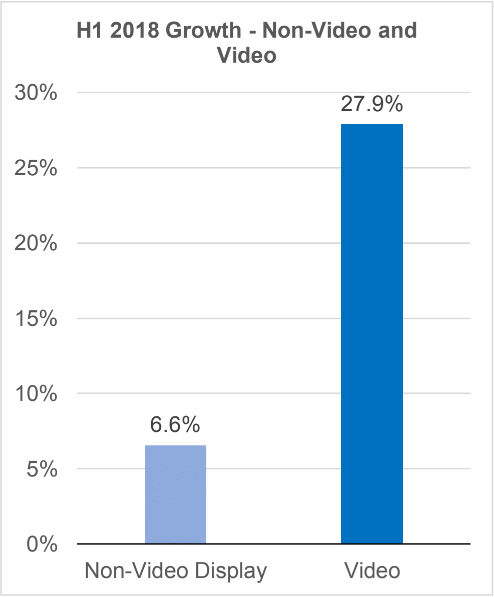 Video grew by more than 4 times total display and now accounts for 30% of the display segment. This expansion of video has increased the total display’s share of the overall digital ad spend market. Display advertising growth continues to outpace search; display grew by 12.3% and search by 10.2%. Display reached over €10bn in H1 2018 representing 40% of total digital advertising whilst search accounted for 46%. Display advertising continues to experience strong growth in Central and Eastern Europe; in H1 2018 it grew by 17.9% compared to 11.2% in Western Europe. Indeed, the CEE region helped to drive the overall growth with an increase of 17% whilst the more mature markets in Western Europe experienced a growth of 9%. Looking ahead IHS Markit estimates that digital ad spend will surpass €50bn in 2018.